I love coding because of the puzzles. I confess that I am not much of a 1000-piece picture-puzzle person. That just seems like so much tedium. Every piece has one exact place to go. There is only one solution. And you can get to that single solution if you mindlessly try to find pieces that fit together for an hour or two. There is no challenge, just diversion. Which is why I like coding so much. There is never a single solution. Heck there might not even be a solution. But it sure is fun trying to find these solutions. Maybe that is why I like testing my code so much. As much as I appreciate the assurance and maintainability that testing gives me, it is yet another challenge. It also presents challenges of setting up tests properly, writing tests that actually test something and, of course, getting the actual code to work. I am working through the project chapters in Patterns in Polymer tonight, hoping to get as much of it covered by tests as possible. This is aided my new eee-polymer-tests test generator / common setup NPM package. Except when it does not work. I am working on the AngularJS chapter which describes using custom Polymer elements in Angular projects. I have some tests in there, but I have the feeling that they are rather old. So my thinking is to run the test generator on the chapter project and overwrite everything (it is all in Git, so I can always get a test back if it proves useful). So what gives? Also, I know this was working in my other projects. What is it about this project that is preventing the force-overwrite option from behaving as desired? Since this is working for some of the generators, but not others, it seems likely that there is a difference in implementation between the different generators. That or it's a permissions issue. It's usually a permissions issue. But not this time. The lack of the word “sync” in there is the giveaway that this is asynchronous code. Node opens a stream to read then merrily executes whatever other code is ready to be evaluated / run outside of this function. Eventually the filesystem responds with the contents of the file and, if Node is not busily executing code elsewhere, it will invoke the callback function with any file content or error information that it might have. And again, when Node tries to write the content to the POLYMER_SETUP file, it will open a write file descriptor then move on to some other business until the filesystem responds that writing is ready. Unless it never gets the chance. And herein lies my problem. While Node is waiting on the filesystem, it continues to work through the other generator business with which it is tasked until there is no more work. And unlike a Node.js server, this generator script just stops without giving the filesystem operations a chance to complete. Node.js will block (not do anything else) until the readFileSync() operation returns. Similarly, it will not do anything else until the new setup file is written and writeFileSync() returns. And once both are done—and only once both are done—Node.js is free it move onto the next generator. In other words, there is no way to accidentally skip any generated files. Is this the best solution? For a command-line operation, it probably is. There might a more Node.js solution (that kind of works)—especially if I am more careful about tracking open file descriptors. But this seems a good enough solution. I am a little unsure why I am seeing this problem now. It may be that the filesystem has more work to do before signaling back to Node that streams are ready. When initially testing, I may have manually deleted some of these files before running the generator. I would not unhappy if all of this just worked, but the harder it is to solve, the more satisfying the solution. Yeah, I think I'll hedge my bets on that one by including both whenReady() and whenPolymerReady(). Unless the name is changed in another unique way, I should be covered. 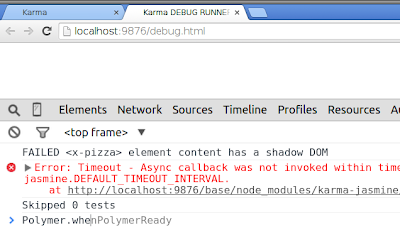 INFO [watcher]: Changed file "/home/chris/repos/polymer-book/book/code-js/angular/test/XPizzaSpec.js". So I got to solve fun puzzles and have as my reward some code that is more maintainable and future proofed. For a coder like me, that is a good day.